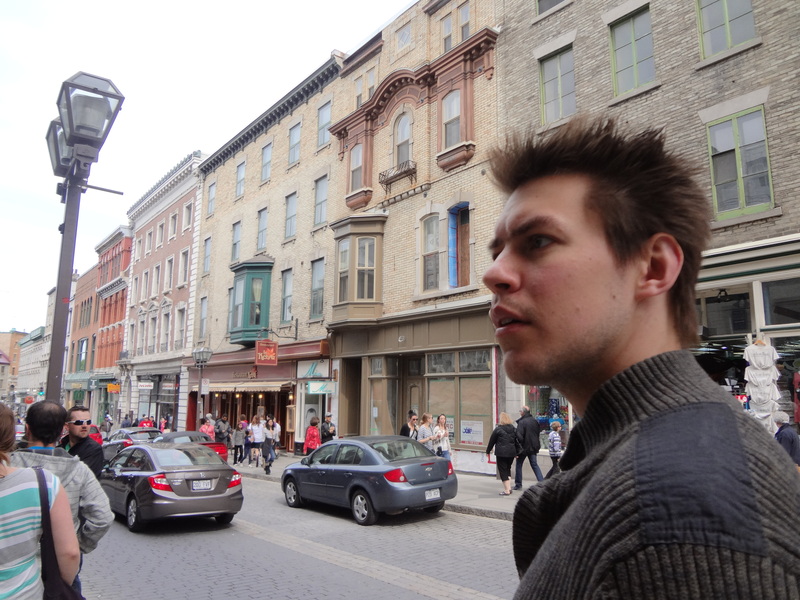 Chris and I decided to take advantage of the May long weekend and drove the 4 hours from Ottawa to Quebec City. It’s a lovely city to explore over a weekend. When you walk around you feel like you’re in Europe: each building stands very close to the next and the streets are full shopping and many restaurants. The best places to stay are usually small B&Bs or boutique hotels. On this trip we choose to stay at Le Chateau de Pierre because we wanted to be walking distance to everything. Our particular room opened up to a private yard that is closed in by the original stone walls of the city. Quebec City is the last fortified city with it’s original walls north of Mexico. 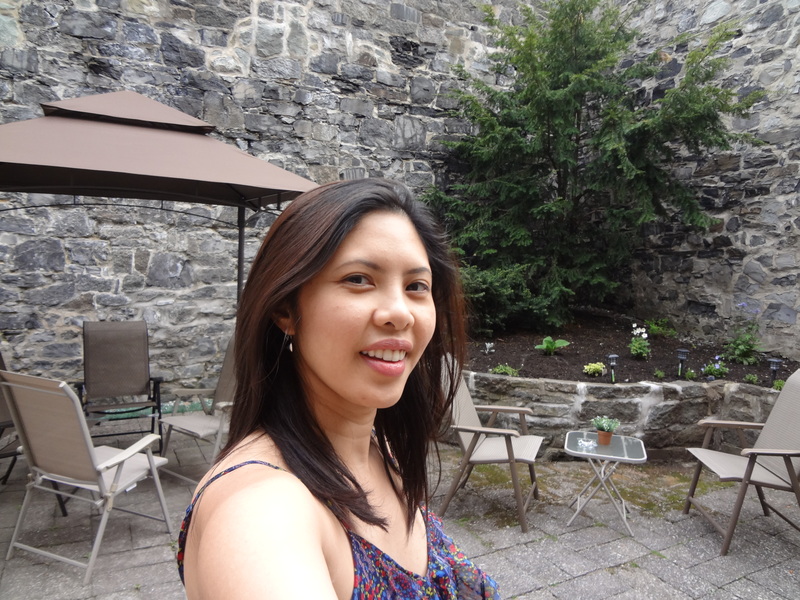 Our Room at Le Chateau de Pierre opens up to the old city wall. How cool is that? There are many outstanding things to eat in Quebec City but we’ll start by highlighting two meals on our trip. On our first night in Quebec City we had dinner at Le Pain Beni because it served our hearts’ desire: Cheese Fondue. If someone asks “Why go to Quebec City?” the answer is simply “Because cheese fondue”. They should need no other reason! If there’s one thing Quebec does well it’s definitely cheese. We split an appetizer size with seasonal fruit and country loaf pieces. It was a very filling appetizer and yet the cheese was light and not too overpowering. It paired well with a very light pino noir we were drinking. For our meals I choose the Pappardelle à l’épaule d’agneau: Bérarc farm braised lamb with sesame carrot purée, mushrooms, carrots and one of my favourite green veggies fiddleheads. 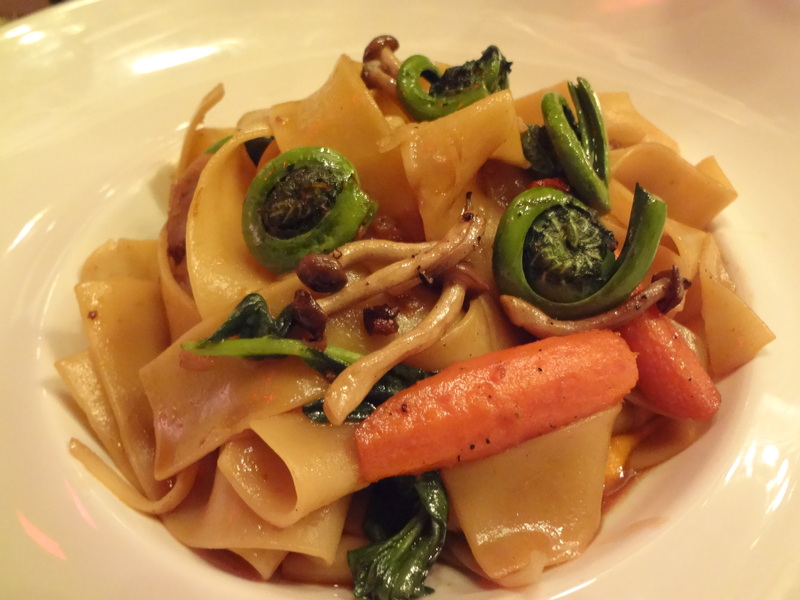 Fiddleheads really dress up a dish! I often forget how much I love pappardelle noodles. The pasta was perfectly cooked and all the flavours of the dish married well together. 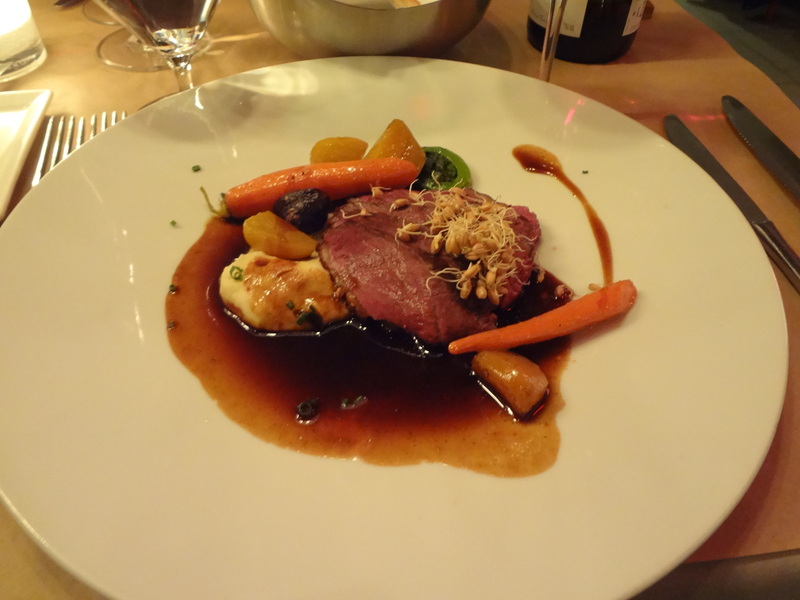 Chris had the spectacular Magret de canard Le Canard Goulu. I may have been a little jealous of his meal. 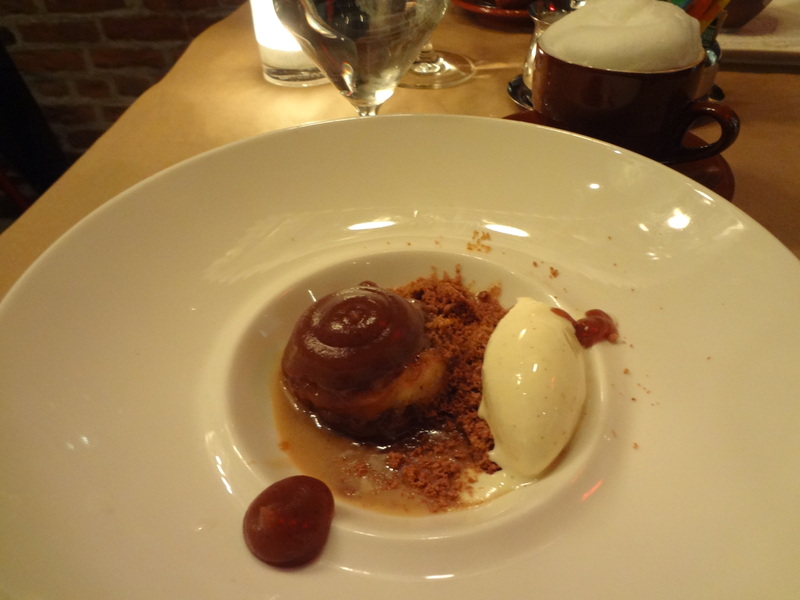 To finish we ordered a chocolate ganache and upside down cake. Both were good but Chris’ upside down cake took it up a notch. I loved how moist and flavourful each bite was. The staff were extremely friendly, attentive and quick. It’s a perfect place for a dinner for two and a great start for our trip. 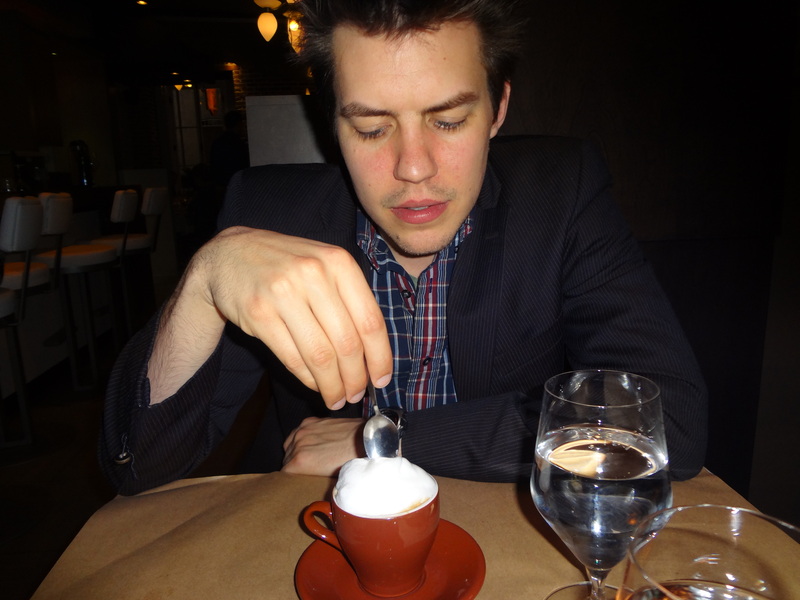 Don’t miss out on this fabulous restaurant if you’re ever up in Quebec City. 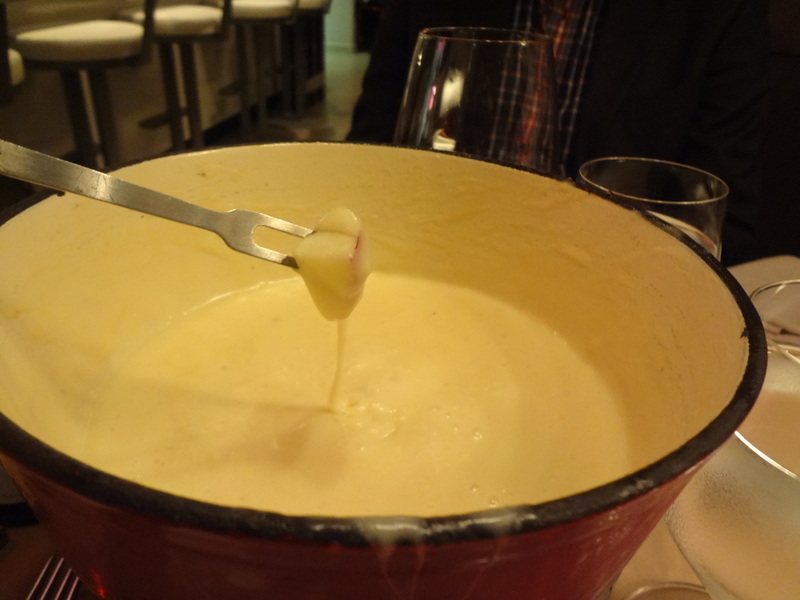 I am still dreaming about that fondue!